Now this was something. 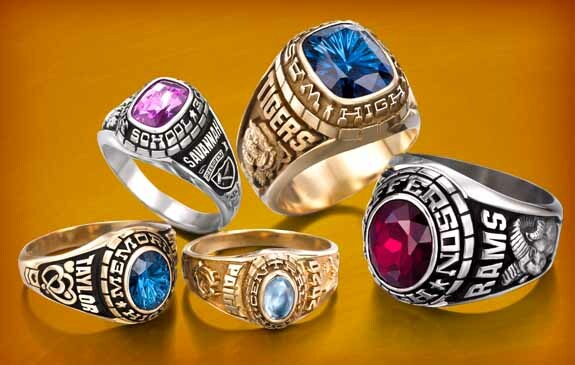 I can still remember the cold November day our class ring sales representative arrived, granted top secret clearance from our school administrators to walk around our building at his leisure, hauling around his cheap attaché case of mesmerizing trinkets. He looked exactly like you’d expect a school ring salesman to look–pale blue “dress slacks,” a crazy plaid sportcoat left over from the 70s, hangdog face, medicine ball-sized paunch, and battered brown shoes that had trudged down thousands of miles of shiny waxed high school hallways. It was the personalization that made the rings irresistible. You could basically recreate your whole teenage identity with these things. Even if your rural Maine high school happened not to have a rodeo team, if you had always been fascinated by roping calves and riding bulls you could go ahead and get “Rodeo Team” stamped right on the side of your ring. Were you a third-string benchwarmer on the roundball squad? No problem–on your ring you could announce to the world that you were a “Basketball All-Star.” Hell, even the most brain-damaged, perennially-flunked burnout could order a ring that said National Honor Society on it, and Mr. Ring Salesman, even if he may have personally doubted that the bedraggled, pot-reeking punk in front of him was capable of achieving such a thing, wasn’t about to run up his family’s long distance bill to call NHS headquarters and have them confirm or deny it. To him, it was just another nice commission. I remember badgering my parents into paying something like $143 for the top of the line “gold” version, a bauble probably cast from melted-down tin Burger Chef ashtrays Jostens had nabbed for a song at some franchise liquidation sale. I even insisted on extras like the special textured underside and my very own laser-engraved signature on the inside. Clearly, I believed in the finer things in life. But why spare any expense when I’d be wearing it for a lifetime!! Jostens manufacturing plant wasn’t the most efficient, I think the turnaround on these things was something like half a year—you ordered it in November and it finally showed up in April or May. But there was no denying it was a special day when our sales rep returned, jacketless now in a nicotine-stained short sleeve dress shirt, to hand out our rings. Students sang and danced in the corridors with such joy it was like Alice Cooper had just arrived to burn the whole school down. I think I wore it five times.